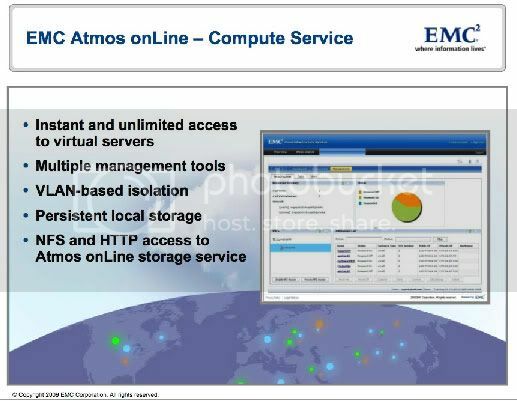 Reports from storage industry blogs and an a EMC Corp. customer event suggest EMC is getting ready to launch a new cloud computing service based on its Atmos onLine storage as a service offering. They’ll be rolling out a compute service “by the end of the year” to support in-data-center access to data. It looks like it’ll be roughly comparable to EC2 plus S3/EBS [Elastic Block Storage]; there was no mention of supporting other features like SDB [Amazon Simple DataBase]/SQS [Simple Queue Service], and of course EMC pricing is likely to keep people on Amazon. They (probably) use VMware ESX, which is more common and familiar than Xen. Atmos Compute Service might even be able to handle existing ESX instances migrated in from private servers! Atmos onLine storage supports NFS in addition to the Atmos API, unlike Amazon’s own S3 which is API-only. They offer VLANs for enhanced network security, which Amazon lacks. They seem to offer per-instance internal persistent IP addresses, another area of frustration for EC2 users. This seems like a likely candidate to be announced at VMWorld in less than two weeks because it ties in with VMware’s persistent cloud messaging. Despite VMware’s marketing efforts, some public cloud service providers such as RackSpace say they find the open-source XenServer more customizable. It would make sense for VMware’s parent company to throw its weight behind VMware as a public cloud offering at this year’s show.